Today's Krokbragd sampler is the fifth in my study of Weft Faced Pattern Weaves using Nancy Hoskins book 'Tabby to Taqueté'. The opportunity to learn techniques in order to better understand and weave Krokbragd was the stimulus for my decision to pursue this study . 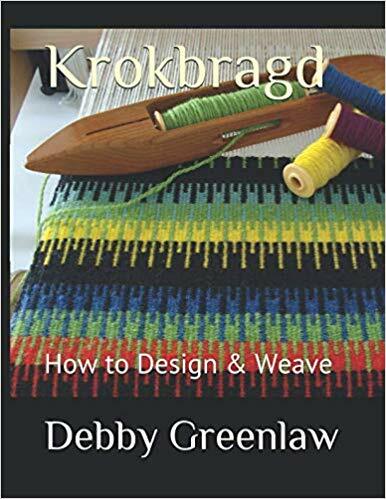 I have written about weft-faced patterns and krokbragd previously. As a quick refresher, Krokbragd is a Norwegian weaving technique. Krokbragd, meaning “crooked path”, is a weft-faced twill structure in which the warp is completely hidden by the weft. For additional introductory information, please see the blog post 'Let's Weave . . . Krokbragd'. Today I'm sharing some new insights and lessons learned since that previous post. The decorative motifs in Sampler V include letters (in this case 'H'), crosses, and a floral. There are also assorted patterns created by stacking columns and cubes in combinations of varying size, number, and position. The design possibilities are further multiplied when different color choices are explored. Krokbragd uses a three-shaft version of a point twill threading. This Sampler lesson reviewed two different drafts that could be followed for weaving krokbragd. In this draft diagram, the red line highlights the three-shaft 'Point" threading (1-2-3-2-1). The blue line highlights a simple tie-up of shaft 1-shaft 2-shaft 3. The treadling (black line highlight) is 1-2-3. A straight twill threading (1-2-3-4), as indicated by the red line highlight, can also be used. However, in this case, the tie-up needs to connect shaft 2 and 4 (blue line highlight). The treadling of 1-2-3 remains unchanged. In essence this creates a three-block draft that weaves a pattern identical to that on the traditional three-shaft point twill threading. The yellow, purple, and green pattern on both diagrams is the same. Using a straight twill threading allows you to add a krokbragd design within a piece you are already weaving in a straight twill threading without the need to rethread the heddles. You would only need to make a simple change in the tie-up. And, If you were using a direct tie-up method, it wouldn't even require that change. I wove this sampler with the straight twill threading on my Jane table loom . Since table looms use direct tie-up, I wove shaft 1, shaft 2 & 4 together, and shaft 3. I wove the header on either end of the sampler using two different methods for the purpose of exploration. The header on the right side in the photo above was woven with plain weave The header on the left was woven with the regular 3 shaft krokbragd rotation. Each produces a different look. The plain weave header does not provide the best coverage of the warp by the weft threads. You can see white dots of warp thread peeking through (see arrow). The left header, using the 3 shaft krokbragd rotation, produces more solid coverage of the warp by the weft threads. Although some projects may be better suited to a plain weave header for strength, for smaller projects, such as this sampler, I prefer the look of the 3 shaft krokbragd rotation. This is a photo of the reverse (back) of the sampler. Comparing it to the previous photo of the obverse (front), it has a markedly different appearance where the weft thread floats are visible. (Actually I find this an interesting fabric as well). In the previous post on Weft-Faced Twills, I talked about clear cut versus twill-type blocks of color. As a refresher, the photo of Sampler II Twill 3/1 shows each color cube or column having clearly defined edges known as 'clear-cut' blocks. In other words, the color blocks do not bleed into an adjacent color block. In contrast, Sampler III Twill 2/2 has color blocks that do bleed color into the adjacent color blocks with the colors being more diffused and the motifs having tiny toothed edges. These are called 'twill-type' color blocks. The bottom photo shows today's Krokbragd Samper V where the color blocks are clear cut like Sampler II Twill 3/1. Finally, a little on achieving nice selvedge edges. First, to balance the pattern blocks on the sampler, the threading began and ended with shaft 1. Floating selvedges are usually recommended for krokbragd. In addition, I used double threads on both selvedges. To control the colors at each selvedge, I made sure that whatever color was used to throw the pick for shaft 1, that was the same color I used at the selvedges. Finally, a new feature I'm adding is a Pin-able Graphic so you can save this post for future reference on Pinterest (and I'd be delighted if you'd share it as well!). I've gone back and added Pin-able Graphics for many of my popular posts. Hovering over the graphic reveals the Pin It button.